Restaurant managers can work within numerous places, from a mom and pop restaurant to a large chain, and everything in between. Restaurant managers get involved in every nook and cranny of the restaurant they’re managing. Find out more about what it’s like and what it takes to become a restaurant manager. Restaurant managers are sort of the ‘face behind the restaurant.' The restaurant manager humanizes the brand, so it’s clearly important that they know what they are doing and can do it well! The top priority of a restaurant manager is to ensure that the restaurant is running smoothly while making a profit. Restaurant managers oversee every aspect of a restaurant. Their duties range from managing to scheduling to hiring, training, and even firing staff. They are also on quality control patrol, ensuring that the kitchen is delivering excellence. The actual job duties of a restaurant manager will depend on the restaurant. Every restaurant has different expectations of its manager. Duties often include overall food presentation, setting staff duties, ensuring serving sizes, maintaining safety and sanitation of restaurant equipment, and so much more. Restaurant managers have to set and keep not only the government standards but the standards for the restaurant, as well. One of the most important front-facing duties of a restaurant manager is their customer skills. Restaurant managers should know how to work and please the crowd to guarantee repeat business plus word of mouth advertising. Being able to deal with the unpleasant, the drunk and disorderly, and all around negativity, which happens often, is equally as important as being able to handle the happy and content patrons. When it comes to restaurant management, prompt, friendly, and professional equals shiny, happy customers who come back for more. As fun and rewarding as being a restaurant manager seems like it would be, there is a lot of hard work involved. Restaurant managers put in a lot of long hours with not a lot of personal time or space. In very busy restaurants, it can get quite overwhelming. But, with the right traits, you can be an incredibly successful and happy restaurant manager. Stamina and strength: We’re talking both physical and mental strength and stamina. You’re constantly running around a restaurant, talking to staff and customers, and taking care of business. Energy is required. Just remember to breathe! Happy restaurant manager, happy customers: A good restaurant manager needs to have a pretty sunny disposition. Rolling with the punches and coming out smiling is a requirement for success. Positivity shines through. Be the leader of the pack. As the manager of a restaurant, you’re the it-person. The go-to for all. If you don’t have good leadership qualities, you probably won’t make an effect restaurant manager. Forward thinking. Meaning, you’re innovative and willing to try out new things and test out new ideas. Whether it’s experimenting with new restaurant trends or new restaurant tech gadgets, you’ll do what it takes to keep current and competitive while maintaining the budget and integrity of the restaurant. Crazy problem-solving skills. To take liberties from the 90’s Rob Base and DJ EZ Rock song, If there’s a problem, you can solve it. It takes you to make things go right. It takes you to make it out of sight. And, all this is because you can think fast and make great decisions. You’ve got that certain something. That certain something is called customer service skills. You’re a people person. You know what to say and do to keep them coming back for more. Charm is your middle name. Your other middle name is qualified. Organized and detailed. One of the seven habits for highly effective restaurant management is organization. Because, you have no choice, you’ve got a lot of stuff going on, and you have to be able to keep everything straight. Another habit is that you’re detail-oriented. You can tell when a button was just sewed back onto a uniform because that blue thread is different. You’re like superhuman when it comes to paying attention to every little thing that goes on around you. Once you have received either your high school diploma or GED, you can consider becoming a restaurant manager. One good idea is to get either an associate degree or bachelor’s degree in either restaurant and hospitality management or institutional food service management. While a degree is not required, it’s becoming more desirable and preferred by those who are doing the hiring. The alternative is working your way up through the proverbial food chain and train on the job. Start out by getting a job in a restaurant, even as a dishwasher, and learn your way up to management. Many successful restaurant managers have done this. And, it’s also an excellent idea to learn everything there is to know about the functions of a restaurant because it gives you more of an understanding of how things need to be done. AN ASSOCIATE DEGREE OR BACHELOR'S DEGREE? Nowadays, it seems that to get a decent job, you need to have some sort of degree, whether a certificate or higher. It can get confusing, choosing which route to take. Any hospitality and restaurant management curriculum should be tailored toward giving students the proper skills necessary to run any size restaurant. With an associate degree in hospitality and restaurant management, you should be adequately prepared to take on a role as a restaurant manager with no problem. You’ll be knowledgeable in all the associated business tasks such as hiring and firing, managing restaurant workflow, safety and sanitation, and every other aspect of running a restaurant of any size. An associate degree should only take two years to complete if you attend school full-time. Keep in mind, you’ll have a certain amount of general education credit hours that will be required, as well as courses in your major. Bachelor’s degrees take approximately four years and are more expensive than associate degrees. There will be a similar curriculum as an associate degree path with courses in sanitation and safety, nutrition, catering, marketing, accounting, and leadership. A bachelor’s degree in hospitality and restaurant management will also prepare you to take on food service roles in many different environments. In bachelor degree programs, expect more advanced courses in event planning, international cuisine, contract management, and advertising. General education courses within both an associate and bachelor’s program will include core subjects like language arts, science, math, communications, a foreign language, and electives. Associate degree programs have a lower course credits requirement than bachelor degree programs. Most programs will include an internship or ‘real world’ experience as part of the graduation requirement. Jobs in hospitality and restaurant management are great because it’s one of those kinds of positions that are not outsourced meaning, jobs will be there for you when you graduate and beyond. There are not any certifications specific to restaurant managers that are required. However, there is a voluntary Food Protection Managers Certification (FPMC) food safety exam given by the American National Standards Institute. And an entirely optional certification for restaurant managers who have supervisory experience in food service and specialized training in food safety can take the exam Food Management Professional (FMP) from National Restaurant Association Educational Foundation. The NRAEF is especially beneficial to restaurant managers who learned their skills through on the job training. Depending on your state, you may need to take a certification exam to handle foods and alcohol. Restaurant managers usually work full-time positions, sometimes totaling way over 40 hours per week. The average annual pay for restaurant managers, according to the Bureau of Labor Statistics, is $50,820. The average salary is strictly that, an average of all reported salaries. And, it could be an entirely different number where you work. The average wage, when it comes to the highest 10%, is $87,120 while the lower 10%, or more of an entry level salary, is under $30,000 annually. Job growth in the restaurant industry is expected to grow nine percent through 2026. However, new restaurants are always popping up nationwide, which keep the demand for highly qualified restaurant managers consistent. 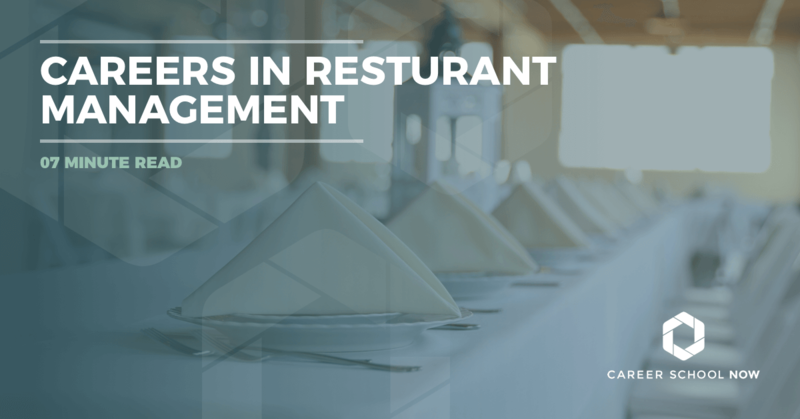 Restaurant managers who have an excellent reputation, and who have relevant degrees, will have the edge over any competition, especially in finer dining establishments.